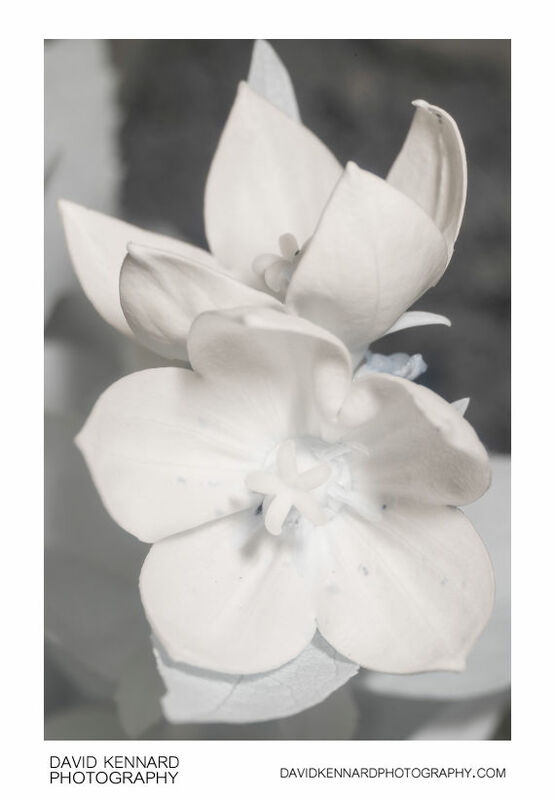 Infrared photo of the flowers of a Platycodon grandiflorus 'Astra Pink' plant. In infrared all the parts of the flower and the plant's leaves appear very similar in tone. The veining on the flower petals can just about be made out, but is very faint. This contrasts quite strongly with the plant's appearance in visible light, where the leaves are significantly darker than the flower, and the petals are slightly darker than the bright white stigma at the centre of the flower. Platycodon grandiflorus is commonly known as the balloon flower because of the way its flower buds swell up like a balloon before they open. The Astra Pink cultivar has light pink coloured petals in visible light. The five petals, which are joined at about half their length, form a star shape when the flower is fully opened. At the centre of the flower is a five lobed stigma, surrounded by five stamens. In the flower in this photo the stamens are withered. The stamens mature before the stigma, in an effort to avoid self pollination.